Harley has a record of excellence in both the DKV and NAVHDA venues. After passing the Invitational in Sept 2009, Harley joined both his sire and dam as NAVHDA Versatile Champions. 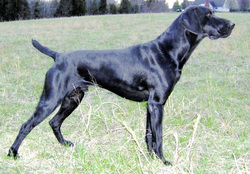 His sire, VC Xavier vom Riverwoods, was the highest scoring VGP dog in the NADKC in 2004. His grandsires are CH Graf KS vom Vehner Moor MH, CD and Kristan KS vom Pottsiepen, who were well known producers and tremendous dogs. In the field, Harley is consistent and productive. He has an efficient hunting style that lends itself to endurance, he can hunt all day for multiple days, and he adjusts his range appropriately to the cover and game. In the water, Harley maintains that efficient movement and uses his excellent nose to find and retrieve ducks. Harley's pedigree is strong in Pottsiepen, Hege Haus, and Wasserschling blood. Both his mother and sire are NAVHDA Versatile Champions. Harley is heterozygous solid and black. This means that he should throw both liver colored and black colored pups in both the solid and ticked patterns.